Patients who receive a dose of radioactive iodine (I131) for thyroid treatment most often are given a greater amount than their thyroid is expected to absorb. Once you have taken the Radioactive Iodine, your thyroid absorbs as much as it is capable of. The excess will be eliminated from your body over the next few days, and for an extended period in smaller amounts as it cycles through your thyroid. 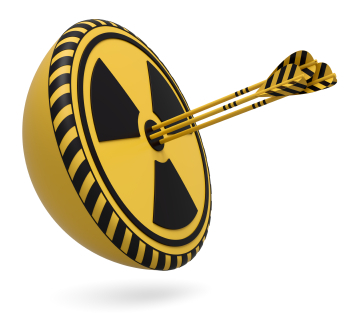 Your body releases the Radioactive Iodine through urine, feces, sweat and saliva. Children and house pets have smaller thyroid glands than adults. Because of this, second hand exposure to radioactive iodine is a real concern. 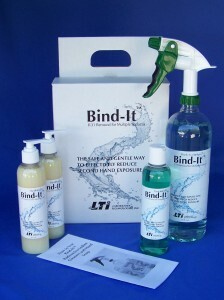 Bind-It™ products can help minimize the dangers of radioactive iodine exposure when used properly along with the guidelines provided by your health care professional. The beta particles that are released during the decay are the component of radioactive iodine (I131) that is responsible for its therapeutic results. Since iodine is absorbed almost exclusively by the thyroid gland, the beta particles will only cause damage to the thyroid tissue. They are not able to penetrate surrounding areas. As the beta particles strike thyroid cells, they cause enough damage to kill the cells, thus destroying the thyroid in a rather non-invasive way. The second radioactive component of radioactive iodine (I131) decay is a gamma photon. This is best thought of like an Xray. It is energy without any real mass. Because it has almost no mass, it is able to penetrate tissue much deeper. This is why you are instructed to keep a distance from other people, as the gamma radiation is exiting your body and can be “seen” by a device such as a geiger counter. Limited exposure to this gamma radiation is not considered harmful to others, since the amount of damage that it does is very limited. However, prolonged exposure by others is not recommended, since the effect is cumulative. Every time you double the distance from the source of the radiation (the patient), the amount of exposure is reduced to 25%. While these numbers are completely arbitrary, for the sake of example, let’s say that a person is 5 feet from a treated patient and is getting 100 (units) of radiation from them. If that person moves to 10 feet away, they will now be receiving only 25 (units) of radiation. This is commonly known as the “inverse square law”.